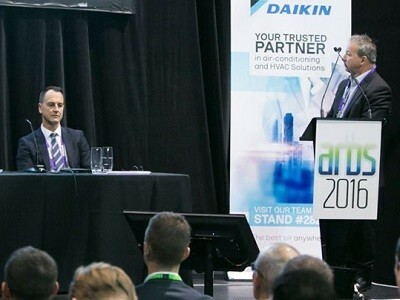 ARBS, Australia’s only international air conditioning, refrigeration and building services trade exhibition returns to Sydney in 2018, showcasing the future of the built environment. To be held at the new International Convention Centre (ICC) in Sydney from 8-10 May 2018, the ARBS exhibition will showcase hundreds of new products, technologies and innovations designed to respond to existing and emerging trends. The ARBS Speaker Series, which will run concurrently with the ARBS 2018 exhibition, will provide a platform to industry professionals to share expertise, innovation and best practice across all sectors of the industry. Spread over all three days of the ARBS show, the Speaker Series is a key component of the exhibition, providing leading-edge education and networking opportunities for the HVAC&R and building services trade and professionals. This essential guide to the ARBS 2018 Speaker Series program provides a snapshot of a few of the exciting seminars lined up for the delegates. The CSIRO will present on the latest findings from a range of real-world FDD case studies in commercial buildings (offices, airports, museums, and retail) where six different FDD solutions from Australian Service Providers were implemented. The case study highlights the unique features of Sydney ICC’s central energy plant. Presentations will be delivered by the lead consulting engineers and contractors behind the $1.5 billion redevelopment and will explore challenges faced throughout the project and key lessons learnt. Don’t miss out on a rare opportunity to go on a site tour of ICC’s central chiller plantroom and experience the system in operation. Low GWP Refrigerants – Is Australia Ready? Have your say and join the ARBS conversation with a panel of industry experts convened to consider whether Australia is ready for low GWP refrigerants. Discussions will focus on practical applications for HVAC&R professionals and what needs to be considered when selecting and using low GWP refrigerants. The panel session explores the barriers and opportunities to the uptake of refrigeration apprenticeships and traineeships in Australia and proposed changes to training packages. Presenters will discuss the importance of attracting a diverse range of people into trades training and outline what is required to support their successful completion and ensure the level of skill required to meet future workforce needs. A significant contributor to achieving the carbon positive goal is the district cooling system that provides chilled water to all types of buildings within the development. Explore challenges including laying the foundations of a workable sustainability strategy; the precinct-wide cooling design concepts and strategies employed; integrating the detailed design of the commercial building’s cooling systems; and the transition from construction to the required operating performance. Join us in a tour of Barangaroo South, a landmark development on the shores of Darling Harbour and one of only 18 projects globally to be a part of the Clinton Climate Initiative’s C40 carbon positive development programme. Join GBCA, NABERS, the Department of Environment and Energy, and AMP Capital to discuss the trends for net-zero buildings in Australia and what this means for the HVAC&R industry. Presenters will outline a vision for a carbon positive future including the outcomes required to achieve a permanent transition for the building sector and explore opportunities to future-proof business success in a low-carbon economy. Big Data – Is it hype or the future? To focus on big data, current uses in other industries and how to apply it to HVAC&R, this session will explore big data analytics – academic or real world (focus on analytical methods); data collection – best practice/data integrity; and data management and artificial intelligence. Recent outbreaks of Legionnaires’ disease in Sydney and Melbourne CBDs have highlighted the need for interventions to firmly address building services design and maintenance practices. This session will describe those systems most at risk and outline control mechanisms proven to be effective. The changes to regulations including the need to apply risk management principles will also be discussed. Increased awareness of the impact of refrigeration and air conditioning on the environment continues to change the way we think and act when making decisions for the future of our industry. The session will provide the audience with a clear understanding of how HFOs combined with diverse refrigeration architectures are already positively impacting the industry through improvements in energy efficiency, refrigerant charge/ leak reduction, total cost of ownership and reduced overall environmental impact. Explore the project ‘Standalone Solar Powered Air-Conditioning System’ which aims to analyse the feasibility of running a system with renewable energy that is generated on-site. The results provide a good indication of what the future may hold for PV powered air conditioning systems, for both small-scale (residential and light commercial) and large-scale applications.